Dear Aspirants, The Exam pattern for bank exams has been changing every year. Due to the dynamic changes in exam pattern, the questions become tougher compared to the previous year. 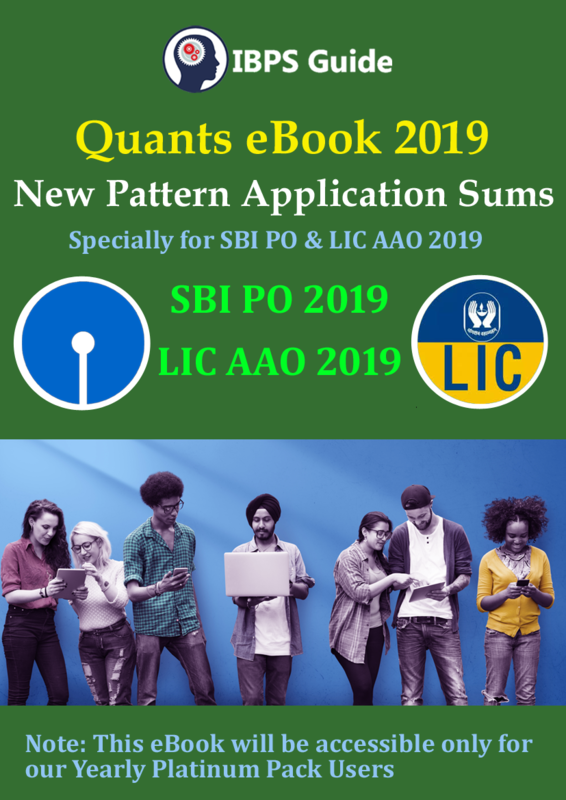 Quantitative Aptitude section is one of the arduous section in SBI PO. The questions are at a high level than the candidate’s prediction. So candidates should update well as per the recent trends. Our expert team was composing the questions under the new pattern of the examination and in aspirant’s exam point of view. This e-book comprises of application questions based on the new pattern. This was prepared by our experts so it will be very useful for upcoming exams. In the recent exams, most of the question comes under the topic of applications sums. Here for your guidance, our IBPSGuide team will provide you the New Pattern Application sum e-book based on the latest syllabus & exam pattern. So candidates should update well as per the recent trends. For your preparation guidance, in upcoming days we will provide Top high-level new pattern application sums-book for our platinum package users. Monthly we will provide two e-books and all platinum package users can access these e-books. Start your preparation now and become a banker in the future. Make use of it and Best of luck.